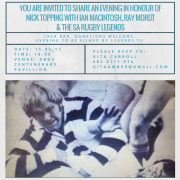 The Nick Topping Trust, in conjunction with SA Legends, is pleased to invite you to a cocktail evening at the Rondebosch Centenary Pavilion from 18.00 – 20.00 hours on Wednesday 15th February to honour Nick’s ‘staying power’ and share an evening with him among old friends. Derek van den Berg – His Blood Runs White and Blue! 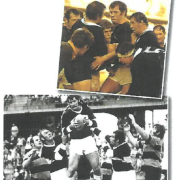 Not many families can boast two Springbok rugby players, but Derek van den Berg and his father, Mauritz, were the second father-son duo to join an unofficial and exclusive club of multigenerational rugby players who have represented the Springboks. 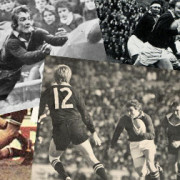 Mauritz, a Springbok in the late 1930’s, represented South Africa as a lock, and his son, Derek followed suit in the 1970’s, after playing for Ikeys and Western Province. 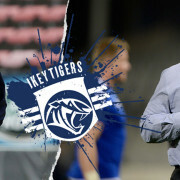 http://ikeytigers.com/wp-content/uploads/2017/01/Derek-Compilation.png 686 452 Ikey Tigers http://ikeytigers.com/wp-content/uploads/2016/06/uct-ikey-tigers-logo-web-blue.png Ikey Tigers2017-01-30 09:35:222017-01-30 13:50:58Derek van den Berg - His Blood Runs White and Blue! I would like to see the guys playing focused sevens and be alert for every moment of the 14 minute games. We often found ourselves going through the motions at crucial moments in the Varsity Sports tournament and it is this aspect of the game which I would like to see the guys make a vast improvement. 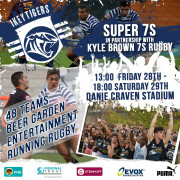 At the official launch of the Ikey Tigers Supporters Club in the new – and sensational – club pub on the Green Mile, I had the pleasure of putting a few questions to Stormers coach Robbie Fleck and WP coach John Dobson over a few beers. It is a challenge to write about a celebrated UCT sportsman who is also a good friend without allowing subjective bias to creep into the picture. It took a long time for me to mull over how I would present John Rushmere to Ikeys of his generation, and to subsequent generations.